It’s virtually impossible to talk about Catfish without spoiling it for all those people who haven’t seen it. As the poster itself says “don’t let anyone tell you what it is”, so I’ll try to be extremely careful, just in case, because I do think people should see this film! 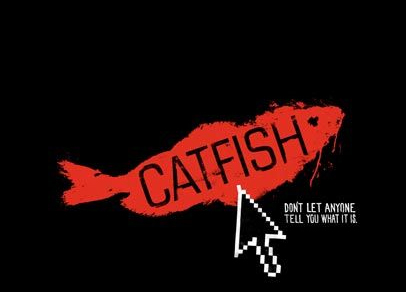 Catfish will suffer from the expectations that moviegoers might have been given by the advertising campaign, which once again is very misleading. The trailer sells is as something that it is not: A thriller or some sort of dark twisty tale. And it’s certainly dark but not in the way you’re expecting it to be: it’s actually so much more than that. It’s a window into today’s world. A touching modern tale of online dating and chatting. A look at today’s society and the ability anyone can have of living a “second life”. If you go into it thinking that it is a horror, you will leave very disappointed. However if you go in with no expectation or an open mind, you will find yourself moved by this touching documentary. The authenticity of the documentary itself has been called into question (though the film-makers swear it’s all true). Personally I don’t think the documentary is a fake, or at least the main story isn’t, mainly because it all seems way too plausible. Yes, of course, some of the sequences might have been re-staged afterwards and some of the realism looks a little too real: for example, all the stuff around the setting up of the microphones, or the shots were the camera has been left on in the car just long enough for us to get the idea that our characters are getting ready.Or the shots of our main guy, with his hand in his pants, as if he didn’t even realized that the camera was on him… Or the final few scenes around the last package that arrives. Even the main’s character’s haircut conveniently changes when we need to know that time has passed . However whether it’s all true or not is irrelevant to me. It’s interesting to compare it with fake-documentary (released only few months ago) “I am here” by Casey Affleck. In that case, the fact that the documentary had been faked it, made the whole thing seem pretty redundant and in the end, you’re just just left with a scam which is hard to take seriously. Here the message of the film is clear and yet at the same time it manages to be quite subtle. It works either way, whether the whole thing has been set-up or not… Oh I wish I could say more! I should probably watch this film again to be able to tell you whether the film is a one time trick or if it might even work on repeated viewings, however I was hooked and on the edge of my seat all the way through. This is what good storytelling is. It’s a clever, thought-provoking and intelligent documentary that will stay with you long after the credits have rolled on. I saw this a week ago and I am still thinking about it. You’re right, if you go in with expectations laid out by the trailer, you will be sorely disappointed. The whole “hitchcock film that hitchcock never directed” comment grabbed my attention! I, unfortunately, ended up being one of those that failed to see any enjoyment in this film as a result of the expectations from the amazing trailers. A great job on your review and maintaining a spoiler-free one at that! Good review. I enjoyed CATFISH just as much as you. I totally agree that the authenticity of the story is irrelevant. You mention that knowing the Joaquin Phoenix film (titled”I’m Still Here” btw) is fake takes away from it. While it didn’t work as well as CATFISH, I felt like the authenticity once again took a backseat to the message. Have you seen EXIT THROUGH THE GIFT SHOP? It is right up there with CATFISH as the best of the 3 pseudo-documentaries. I probably liked it a little better. I’m also looking forward to seeing CATFISH again, wondering if it will hold up.